With a voice that rose from velvety to victorious in the time it took Bobby Orr to slap a puck into the goal, Fred Cusick brought radio listeners and television viewers onto the ice with the Boston Bruins from 1952 until 1997 and was famous for stretching out the word score until it seemed as if it had as many vowels as there were players. A broadcasting legend for Boston sports who called the Bruins’ last game at the old Boston Garden and the Patriots first football game, Mr. Cusick died in his Barnstable home yesterday of complications from bladder cancer. He was 90 and will be inducted into the Massachusetts Broadcasters Hall of Fame tonight. “He was a pioneer in the broadcasting of televised hockey games, no question about it,’’ said Harry Sinden, former general manager and president of the Bruins. Mr. Cusick was the first American broadcaster inducted into the Hockey Hall of Fame and in 1988 received the Lester Patrick Trophy for outstanding contributions to hockey in the United States. Through the years, Mr. Cusick broadcast on radio and television stations that included WBZ-AM, WSBK-TV (Channel 38), and NESN, with such on-air partners as former Bruins player Derek Sanderson. He also did a stint broadcasting NHL games for CBS television. Part of his impact was simply opening television’s door to the Bruins. In the early 1960s, Mr. Cusick personally got the team on the air by watching a game in Toronto on a Saturday night, then driving the videotape to Manchester, N.H., stopping en route in Concord, N.H., for a few hours of sleep. At 11 a.m., the taped game was broadcast on WMUR-TV. Prophetically, he convinced the broadcast television community that the team’s fortunes were soon to change, and they did a couple of years later with the arrival of Orr. As the devotion of fans intensified during the team’s Stanley Cup victories and beyond in the 1970s, Mr. Cusick’s voice became as recognizable as a Bruins jersey, his name as familiar as Orr’s or Phil Esposito’s. For Mr. Cusick, who could turn “Score, Bobby Orr!’’ into a poetic couplet, looking down at the ice from the booth was like being paid for having fun. Born in Brighton, Frederick Michael Cusick was one of three sons born to Irish immigrants from Galway. He was the baby of the family and treated as such. Mr. Cusick began his love affair with hockey by playing with friends on a pond or the Charles River when it froze. At Northeastern University, from which he graduated in 1942, Mr. Cusick excelled at hockey and also played football and baseball. Then he joined the Navy, commanding sub chasers during World War II and staying in the Naval Reserves until 1946, when he left as a captain. His first taste of radio came in 1941, when he was paid with passes to Fenway Park for a nightly sportscast on WCOP, but he really began his 51-year career in 1946 at WOCB on Cape Cod. While there he met Barbara Mullin, a teacher who worked as a waitress on the Cape in the summer. They married in 1947. Mr. Cusick moved through the radio ranks quickly, to WBET in Brockton and WVOM in Brookline, where he created a popular “Irish Hour’’ program. He broadcast “just about every sport imaginable,’’ he told the Globe in the e-mail, a list that ranged from tennis to bowling. 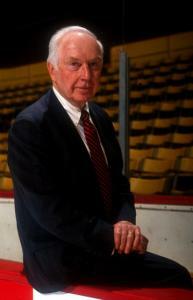 In 1952, he began broadcasting Bruins games on the radio for WHDH. Though fans knew his voice, players and team executives saw another side of Mr. Cusick. In addition to his wife and son, Mr. Cusick leaves three daughters, Sarah and Martha of Barnstable and Mary of Brookline; and three granddaughters. A funeral Mass will be said at 11 a.m. Saturday in Our Lady of Victory Church in Centerville.